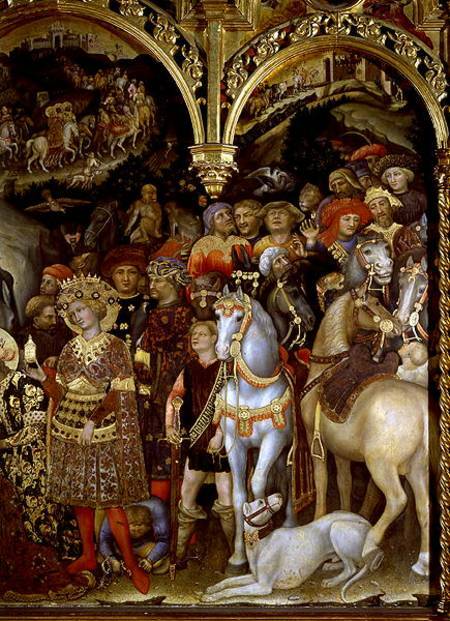 In Getile da Fabriano’s altarpiece, the Magi are depicted as contemporary Italian princes. Although Florence was a republic, and hence had no monarchy, the elite families (the Strozzi in this case) identified with the Magi over more humble Biblical role models. The Magi, after all, were kings, and if they could get away with being both rich and powerful, then so could the Strozzi. The painting was executed for the Strozzi Chapel in the church of Sta. Trinita (Holy Trininty). In it, the Magi are representative of the Strozzi family, and make a very public statement about that family’s position and ambitions. The Magi have an enormous courtly entourage, and it’s this train of people that can be seen at the top of the panel, under the three arches, making their way to Bethlehem to see the Christ Child. The courtly aspect comes in when you begen to look at the details. Then, you might notice hunting hawks and dogs, and all kinds of attendants in a variety of very fashionable hats. There are even some monkeys. These are all accoutrements of a royal court, and indicate that the Strozzi are comparing themselves to contemporary royal courts in the non-republican parts of Italy. The leopard and camel are not as likely to have been owned by contemporary royalty (although they were sometimes imported into Europe). The frame is original, although the bottom left panel of the predella is a copy, as the original is in the Louvre. At the top or the frame are three tondoes, with Christ giving a blessing in the centre, and an annunciation divided over the left and right tondoes. In the left tondo is the Angel Gabriel, and the Virgin is in the right. I chose this image for Christmas Eve because it’s so gorgeous, and becuase it tells us so much about the patrons, and the culture that produced it. And that is, for me, one of the most significant attractions of art history as a discipline – the opportunity to get closer to past cultures through the study of the material objects with which people in the past chose to surround themselves. And all that remains now is for me to wish you all a wonderful Christmas and a happy new year!